Villagers in Papua New Guinea point to their village destroyed in a landslide from a quarry being excavated for a liquefied natural gas project. Credit: Catherine Wilson/IPS. SYDNEY, Feb 22 2014 (IPS) - Natural reserves such as gold, copper, nickel, gas and timber are being extracted in the western Pacific island states of Papua New Guinea and Solomon Islands to feed the soaring economies of East and South East Asia. But despite these Pacific nations recording economic growth rates of 6-11 percent over the past seven years, opportunities for human development have not been grasped. “There is very little confidence amongst communities in resource extraction projects that governments are operating,” Maureen Penjueli, co-ordinator of the civil society organisation, the Pacific Network on Globalisation in Fiji, told IPS. 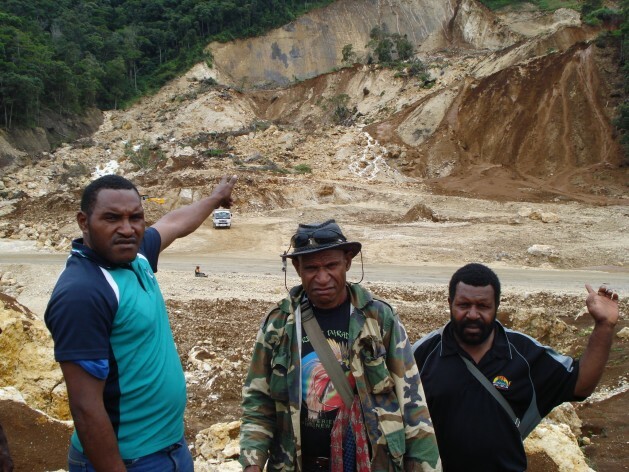 In Papua New Guinea (PNG) there are at least six mines extracting gold and copper. The nation’s largest resource project, PNG LNG (Liquefied Natural Gas), centred in the highlands is expected to begin supply this year, while generating up to 1.5 billion dollars of annual government revenue for the next 30 years. The Solomon Islands, an archipelago to the northeast of Australia, has a 50-year history of timber exploitation. Logging currently contributes to 15 percent of state and 60 percent of export revenues. Natural resource management has brought the interests of corporate developers determined by short-term profit competing with local Melanesian perspectives that prioritise culture, identity and the well-being of future generations. The PNG government claims a state right to mineral resources, while in the Solomon Islands traditional landowners determine timber extraction. Either way ordinary citizens have experienced no benefits. Two million in a population of more than seven million in PNG live in poverty, while the under-five mortality rate is a high 75 per 1,000 births. In the Solomon Islands 23 percent of people live below the poverty line, and literacy is 17 percent. Pacific island governments with shortfalls in capacity and expertise can be disadvantaged in negotiating resource agreements with international investors. An unhealthy alliance between the political elite and foreign companies has served the interests of a few, while negatively impacting the rural majority who suffer inadequate public services and human rights protection. In the Solomon Islands an influx of Southeast Asian logging companies in the 1980s paralleled escalating corruption and declining regulatory compliance. Solomon Islands landowner Lily Duri Dani said that corruption had resulted in women resource owners being “pushed aside” in decisions about land use. “Women would make decisions that are honest, open and fair to everybody. We would use the [resource] money to help people at the grassroots,” she declared. The PNG LNG project is set to deliver a windfall to foreign investors that hold 80 percent ownership, including Exxon Mobil and its subsidiary, Esso Highlands. Social impacts documented by the New Zealand-based Otago University include increased inequality, alcohol consumption, domestic violence and prostitution. Local communities have also faced a 38 percent food price increase and deteriorating education and health services as staff seek more lucrative LNG-related jobs. In 2012, a devastating landslide from a quarry being excavated by a project sub-contractor buried two villages, Tumbi and Tumbiago, killing an estimated 60 people and destroying 42 homes. Safety concerns about quarry operations had been identified by an independent environmental consultant, D’Appolonia, the previous year. The PNG Government has failed to commission an independent investigation into the disaster, leaving victims deprived of justice. The Porgera gold mine, located in Enga Province and majority owned by the Canadian company Barrick Gold, has produced 20 billion dollars worth of gold in the past 20 years. Communities in the area live in severe poverty while HRW has reported gang rapes committed at the mine site by private security personnel in 2011. Last year the United Nations Development Programme (UNDP) organised a Pacific conference in Fiji to tackle the question of how natural resource exploitation could translate into improving the lives of ordinary citizens. But the necessary framework of good transparent governance, strong extractive industry regulation, environmental and social protection measures and participation by rural communities in decisions about resource use is yet to emerge in the region. Penjueli advocates that “a key role for civil society organisations is to mobilise the public to engage with difficult questions of human rights and social justice” in the extractive sector. Indigenous communities need to be empowered with skills, knowledge about the implications of decisions and alternative livelihoods, and better access to legal support to defend their rights, activists say. We must hold nations accountable. If the company that is cheating the people of PNG-their country of origin must be held responsible. PNG government controls the law enforcement and judiciary and nothing can be done in PNG. It is countries like Australia that should be blamed for this terribly theft of natural treasure that could so easily be used to develop the country. Shame on Australia and Australians! the duty to protect should also include ” CHEATING “…bad enough colonial masters raped the world-now it carries on with impunity.